In our roundup of the best new airport amenities of 2017, we celebrated perks such the 24-hour “microcinema” at Portland International Airport, Pittsburgh International Airport’s introduction of “MyPITpass,” which allows the nonflying public to visit the secure side of the airport, and the opening of ROAM Fitness, an in-airport gym at Baltimore-Washington International Airport. The 2018 honor roll is once again full of fresh new amenities and creative bonus activities introduced by airports, airlines and in-terminal vendors working hard to make airport dwell time less stressful, more enjoyable and, at times, surprising. Airport restroom lines get long when users can’t tell which stalls are empty. 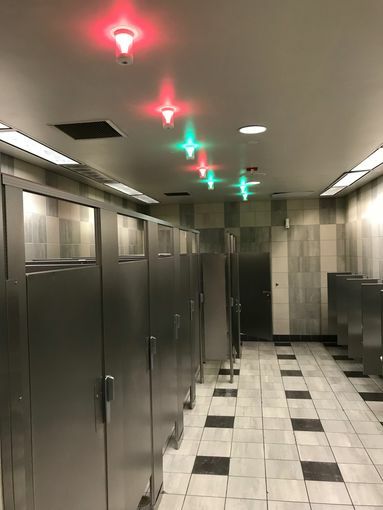 To solve that problem, in April, Los Angeles International Airport debuted a pilot program in one set of Terminal 4 restrooms using Tooshlights’ smart latches on stall doors. When a door is closed, a light over the stall turns red; when the latch is open, the light turns green. The latches are paired with the Infax smart restroom technology, which tracks usage and real-time feedback to improve restroom cleaning schedules.